It's their first Test win in India for twelve years. Australia's pretty stoked to be 1 up in the Test series against India. Poor India. It's never nice to lose, but 333 runs just isn't a good look. 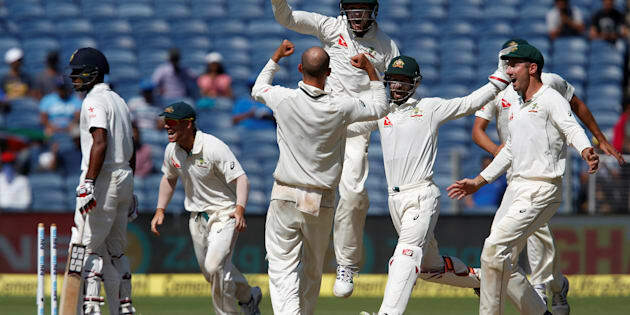 Australia has ended a nine match losing stretch in Asia, claiming a 1-0 series lead on day three of the first Test in Pune. It's the first Test win in India since late 2004. That's twelve years. WOO! But the Aussies didn't just win, it was the most unlikely and spectacular demolition job against the all-conquering Indian squad. Australia dominated day one and two of the Test, so it was already looking real good for the Tourists. Australia set themselves up for a historic victory on day three, reaching 285 runs at the stumps. All thanks to legend and all-round gentleman Steve Smith who smashed a century to set a target of 441. It's his 18th Test match century, but classic Smith said it was all just "a little bit of luck". India has a seriously killer batting line-up -- a critically acclaimed, five-star line-up -- so anything was possible after lunch. But considering the highest successful Test chase was 418, by the West Indies against Australia in 2003, it wasn't really looking good for the hosts. The Aussies bowlers quickly made sure any hopes of a comeback crumbled like a Sao in 50 degree heat. Steve O'Keefe alone notched twelve wickets during the Test -- the best figures for an Australian bowler against India. Obviously, he got man of the match. "It's good to go one-nil up, we know how hard it is to win over here," he said. I bet it is, O'Keefe, I bet it is. This guys Tweet sums it up. No Indian will name his child 'Steve' and maximum Australians will. #IndvAus#INDvsAUS Steve Smith Steve O'Keefe. Nathan Lyon did his part bowl the hosts out for 107 in 33.4 overs after they had been bowled out for 105 in 40.1 overs in the first innings. But let's go back to feeling sorry for India, it's their second heaviest defeat by runs at home. Their star-studded (excuse the cliche) team hasn't lost a Test at home since 2012. Last time they crushed Australia 4-0. It's the 10th home Test of India's summer, so maybe they're knackered. So, is this the beginning of the most unexpected series victories for Australia?